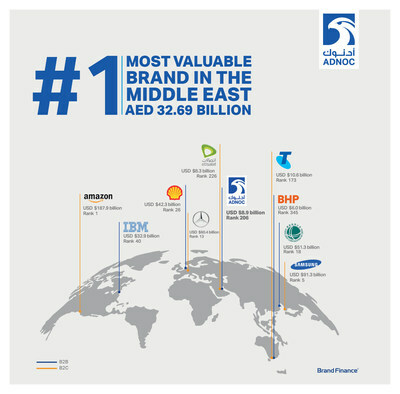 The Abu Dhabi National Oil Company (ADNOC) has been named the most valuable brand in the Middle East, by Brand Finance, the world's leading brand valuation and strategy consultancy. ADNOC, is the first regional oil and gas company to be featured in the annual Brand Finance Global 500 report with a brand valuation of US $8.9 billion (AED 32.69 billion). It is one of five Middle East brands included in the list of the world's 500 most valuable brands. His Excellency Dr Sultan Ahmed Al Jaber, UAE Minister of State and ADNOC Group CEO said: "In line with the leadership's guidance, ADNOC has been undergoing a significant business transformation, underpinned by innovative partnerships and investments that are key to unlocking and maximizing value across our full portfolio. "ADNOC's transformation and growth strategy has been supported by transparent, proactive and strategic communications and marketing, which have played a critical role in reinforcing the scale of our business, the size of our contribution to the UAE's economy, and the extent of our impact on the global oil and gas industry. "This honour is a well-deserved recognition of the hard work and dedication of all our employees who are reshaping the company, as we forge ahead with our integrated 2030 growth strategy and further unlock, enhance and create value from all our resources," H.E. Dr Al Jaber added. In addition to ADNOC, two other UAE brands, Etisalat and Emirates, are included in the Brand Finance Global 500 list which is headed by Amazon and also includes IBM, Shell, Mercedes-Benz, Samsung and China's State Grid, Asia's most valuable B2B brand. David Haigh, CEO of Brand Finance, said: "As ADNOC leverages the opportunities being created by the evolving energy market, its brand value has demonstrated significant growth. Its debut in our ranking of the world's top 500 most valuable brands, and as the most valuable Middle East brand, is a testament to its on-going commitment to becoming the National Oil Company brand of the future and its role as a powerful catalyst for economic growth, diversification, in-country value creation and foreign direct investment into the UAE." Brand value is understood as the net economic benefit that a brand owner would achieve by licensing the brand in the open market. Brand strength is assessed through a balanced scorecard of factors, including marketing investment, stakeholder equity, and business performance, and is used to determine what proportion of a business's revenue is contributed by the brand. Founded in 1996, Brand Finance is the world's leading independent branded business valuation and strategy consultancy. Headquartered in the City of London, we are present in over 20 countries. Every year Brand Finance values over 3,500 brands - across all sectors and geographies. The 500 most valuable brands are included in the Brand Finance Global 500 2019 league table. ADNOC is one of the world's leading diversified energy and petrochemicals groups with a daily output of about three million barrels of oil and 10.5 billion cubic feet of natural gas. With 14 specialist subsidiary and joint venture companies, ADNOC is a primary catalyst for the UAE's growth and diversification. To find out more visit http://www.adnoc.ae.